I trust each of you had a joyous Easter break celebrating Christ’s resurrection with family and friends. With just a short nine weeks left of this school year we are in the homestretch to summer! In the meantime, there is still plenty to be done and we need your help! The big remaining PTC events this year are Teacher Appreciation week, End of Year picnic and Field Day. These are fun community events that require many helping hands. Speaking of helping hands… have you ever considered joining the PTC as a board member? The PTC plays an integral part in the daily life of the school. As a parent you are already a general member of the PTC. Your generous donations of time, money and talent through events such as Auction, Gingerbread house decorating, Bingo, Family Game Night, etc.. help to enrich our community through fellowship and financial support. The funds that the PTC earns each year are used to help fund many different projects and events for our school each year. We help to support field trips, transportation for field trips, special projects and teacher wish lists just to name a few. The PTC currently has open positions for the 2018-19 school year. The application process is easy. Fill out a paper form located on the front bulletin board or on line (click here to get the application) and follow the instructions to submit. Applications still being accepted. Each position is a two year commitment. The first year is as a co-chair to a committee and the second year you serve as chair to that committee. Board meetings are once a month at 7pm and only Chairs are required to attend (or if Chair is unable to attend the Co-Chair may attend in your place). As a Chair and/or Co-Chair you have a support system for your committee through our PTC staff liaison, PTC President as well as other board members (both past and present). Serving our Parents, Teachers, Children and school has been an absolute blessing to me personally and I am so grateful to have said “yes”. I hope you prayerfully consider saying “yes” as well. With the end of the quarter upon us we enter the home stretch of the school year. Nine weeks until summer break for the students and the 8th graders moving on to bigger things. The eighth graders are now becoming excited with the end of the year events, graduation and new schools on the horizon; but a little saddened by the end of their MIS career. They will miss us and we will miss them but for the time being, we still have nine weeks together to work hard at being better students, friends and Catholics. They should enjoy every day and live in that moment so as not to lose a second of their time here. For the rest of us this means we have nine more weeks to work hard and learn all we can about our subjects and get ready to come back in the fall ready for a new grade. There will be lots of changes in the coming months for MIS and I am excited to see where we can go. Change can be difficult but I think it is also very positive and will be a blessing for the school and all who work here. I hope you all had a blessed Easter and wonderful family times together. For those who have responsibility in economic matters that economists may have the courage to reject any economy of exclusion and know how to open new paths. We are now in Lent, which means the 7th grade will be presenting their beautiful and moving Stations of the Cross every week at 9:15 on Wednesdays. These are live Stations of the Cross, each one based on a particular theme or focus. In these presentations, you can truly see what makes MIS such a special place. Through our faith, we show our strength. Also in March, we have Spring Break so I want to focus on family time as it relates to activities outside the home. Throughout the 22 years I have been teaching, one area that worries me is the decrease in museum attendance. We have wonderful museums in this city and in neighboring Ft. Worth. In fact, some of the best in the nation are here in the Perot Science museum in Dallas and the Kimball Art Museum in Ft. Worth. I would like to emphasize the importance of the arts and how they can help us grow. I was recently at a choir concert and heard the visiting director describe art and music as a doorway to our potential as a society. A way for us to see what we could and should be. As a family, my wife and I have always felt it necessary to expose our children to the arts in all forms—from the Winspear Theater to the Nasher Sculpture Garden to the Biblical Arts Center. We recognize that these are wonderful places for our children to grow in their humanity and see pieces of art or hear music that truly speak to the soul. Now, I am also very frugal so I always try to get to these for the least amount possible. The good news is that the Dallas Museum of Art (a beautiful arts center just downtown near Clyde Warren Park) has free admission to all of its permanent exhibits during the day. This is a great place to start your children and yourself in appreciating some wonderful pieces of art. The Nasher Sculpture Garden does charge for adults but anyone under 12 is free. The Crowe Collection of Asian Art, across the street from those two museums, is always free as well. I cannot think of a more soul-teaching day than wandering the museums and seeing the beautiful pieces of art in a wonderful space. I also strongly believe our young students can all appreciate the work it takes to make these pieces and the talent involved. Consider taking a moment this Spring to appreciate the art around us in our community and see what we can be. Lastly, I want to talk briefly acknowledge the unfortunate events in the news that continue to happen in schools across the United States. I want you as parents to know that we take safety very seriously at MIS. With drills and work to keep the building secure, along with your help, I feel confident that we are doing what is needed to keep our students safe. The Pope’s Prayer Intention for March 2018 is Evangelization: Formation in Spiritual Discernment...That the Church may appreciate the urgency of formation in spiritual discernment, both on the personal and communitarian levels. February was gone in a blink…however, PTC members were busy volunteering! We started the month out in the middle of Catholic Schools week—a great week with so much help from our many volunteers particularly Nolia Norra, Angie Borino and Cathy Garrett. They made sure that everything ran smoothly each day and especially with the “grand” finale of the week—Grandparents Day and Mass. They, with the support of so many of our volunteers, did a fantastic job despite having to make multiple adjustments due to the flu that was flying around the school (and everywhere else!). The rest of February has been consumed with the Auction! From the Auction team buzzing with activity and final preparations to the buzzing of the attendees who have been anxiously awaiting a night of fun supporting our school. When Mustangs say they are “All In” we mean it! The Auction, which was held this past Saturday, was an incredible night filled with Mustangs past and present celebrating the dedication, love and commitment to our school. Thank you so much to our Auction Team, headed by Jenny Long, for pouring so much of your time, energy, effort, talent and love into this event. It was truly a success in every way. As we say goodbye to February and hello to March we look forward to more PTC events activities ahead of us. One of the items that PTC is working on in March is the board for next school year. If you would like to learn more about the PTC and how you can be a part of the team, please reach out to any PTC member or join us for our monthly meetings on the second Wednesday of each month (exception for March due to Spring Break) to find out what it is all about. If you would like to apply to be a committee chair/co-chair please see any current member of the PTC to submit your application. Thank you again Mustang families for your continued support through all your volunteer efforts. We are so grateful for all you do for our children, Teachers and staff, and school. By the time you read this we will be in the middle of Catholic Schools Week. This is our annual week of celebrating what makes us different from public, charter and private schools…and there is a definite difference in what we do and why! I hope you are all enjoying the events as well as your students. It is a time to celebrate and to remember the blessings we receive from sending our children to a Catholic school. February is a slow month, from the student’s point of view, with little to look forward to since there are no big breaks. You can help them stay motivated by pointing out the light at the end of the tunnel. Maybe reminding them of why they go to school and what the future can hold. It will go by fast to us but the kids will feel the drag. We will be moving the Valentine’s Day parties to Tuesday the 13th due to the 14th being Ash Wednesday, so that the children can enjoy the parties without worrying about their new Lenten promises. As for Lenten promises, now is a good time to talk as a family and encourage each other in making a pledge for Lent. Maybe adding a family prayer or committing to one night a week of family time with no electronics once homework is done. At the very least, you can encourage each other to choose something that is a true act of giving something up for God. No matter what is promised, Lent is a time to prepare for God’s only son to save us all. It’s 2018 and the PTC is off and running! I would like to give a big thanks to Heather & Sean McIntyre and Carl Flusche for all their hard work on putting together the 8th grade interviews. This is an important offering by PTC Community Enrichment and the MIDs. The 8th grade interviews allows our 8th grade students to practice their interview skills for High School Admissions, summer jobs or internships, and general practice in publicly speaking. Thank you to all the parents who volunteered to assist with the mock interviews! The Auction team has been working tirelessly for months on planning and organizing the 2018 Auction which is being held on February 24th. We hope you got your tickets for this evening of fun with fellow MIS parents, friends and faculty that you will not want to miss! The Auction team teamed up with three MIS families to host three Gift Gathering parties to support the auction efforts. Gift Gathering parties, in addition to having a fun evening with friends, are held to support Underwriting, Large Auction and Silent Auction efforts. Underwriting is a direct donation to the auction on behalf of your business or your family. Large Auction is where the live bidding is done via our auctioneer for packages put together via donations for sports and entertainment tickets, travel, club membership for golf, spas and fine dining. Silent Auction is a direct donation to help create basket packages and unique items (signed football, necklace, piece of art). These items are all collected through the Gift Gathering parties or can be dropped off in the school office. A huge thank you to Adele & Eric Verdiguel (K-2nd ), Elisa & Mauricio Ortiz-Segura (6th-8th ) and Erin & Steve Blair (3rd- 5th ). Catholic Schools Week is a week-long celebration of being a Catholic School! With all the celebration and fun comes a lot of behind-the-scenes work. Nolia Norra and Angie Borino, our Spiritual Enrichment Chair and Co-Chair have been planning and organizing this exciting week. Thank you to all of you who have already given or offered your support. If you have not had a chance to volunteer please consider helping with this event. There are all sorts of needs every day that week from big to small tasks but all equally important. Did you know that Head, Co-Head and Room Parents are part of the PTC? Room Parents are part of PTC’s Volunteer Services headed by Amy Rodgers and Amy Nunez. The Room parents are on the front lines of what is going on in the classrooms on a daily basis. They know first-hand how hard our Teachers are working to ensure the very best academic experience. The Room parents work hard to support our Teachers with class projects, events, field trips, and parties. I know all the room parents are working doubly hard right now finishing up the class gifts for auction! Thank you to each one of you for all you do to make our Teacher’s and children’s classroom experience great. Are you thinking about joining PTC? Have more questions? Please ask me or any member of PTC! God Bless & Go Mustangs! The Heart of Gold Auction 2018 has Sold Out! For the first time in Mary Immaculate History, we sold our tickets in a week! We are thrilled to be hosting such an exciting event! February 24, 2018 is going to be a great night! There is going to be plenty of fun to be had by everyone. Cocktails will start at 6:30PM, with dinner at 7:30PM, live music and fundraising will round out the evening. But, there will be plenty of surprises to be had along the way. In the next few weeks watch for a Texas Hold Em buy in! There will be a tourney after the Live Auction for our poker players out there, to show their card skills in real time! Ladies, make sure you pack an extra pair of “comfy” shoes for a long night! The dance floor will be open for long hours and we have “The Signature Band” and a Special Guest Appearance to help us dance the night away in true Vegas fashion! The Auction Committee would like to thank all of the donors, volunteers, families, and people from the local community who have donated and worked so hard to make our auction such a success! A special thank you to our Gift Gathering Hosts, Eric and Adele Verdiguel, Mauricio and Elisa Ortiz-Segura and Erin and Steve Blair, for hosting the Gift Gathering parties in their homes. They were a huge success and a wonderful start to our auction season! We will see you on February 24, 2018—it’s going to be a night to remember! You have heard on local news channels that the Dallas County Health Department is reporting very high influenza activity throughout the Dallas/Forth Worth area. As expected during this time of year, we have noticed several confirmed cases among MIS students—but nowhere near the amount of absences felt in those schools/districts that have made the news. This is due in part to asking our janitorial company to do in-depth wipe-downs of surfaces and handles, and having teachers to do end-of-day surface cleaning as well. Use hand sanitizer or wash hands before going to lunch. Use hand sanitizer or wash hands after coughing, sneezing, and blowing nose. Wash hands with soap after using the bathroom. Use cough and sneeze etiquette by covering nose and mouth with a tissue when sneezing or coughing, or to sneeze or cough into sleeve if a tissue is not available. Students use only pens/pencils/crayons from their own school supply. Stay home with the following symptoms; fever with a sore throat and/or cough, body aches, fatigue. Any students with a fever (temperature 100 degrees or more) may not return to school until fever free without the use of fever-reducing medicine for 24 hours. Everyone receive the seasonal flu vaccine as soon as possible. Students change out of their school uniform upon arrival home to be laundered each day. Thank you for your attention to this and promoting good health at MIS! After meeting tonight (Monday night) with the MI School Advisory Council, I am reminded that the theme for this school year, as set forth by Principal Krause, is “family”! As the family “father” I wish to reiterate that our MIS family is strong and resilient. With the recent and upcoming changes in school administration, I want to reassure you that we are and will be just fine. God’s got this! Regarding the Principal search, I am in dialogue with the Diocesan School Superintendent and the position will be posted on their website soon. The Superintendent is intimately involved in helping us fill Mr. Krause’s position. I hope you all had a blessed break for Christmas and New Years and that you were able to have some quality time with your children and family. As always, that is what life is all about. As we enter this new semester, I wanted to take a few lines here and talk about new beginnings as far as the school year goes. January is difficult for students with the excitement of Christmas over and spring break so far away. They must focus on studies with few incentives at this point. So, how do we as parents help with this? Consider helping your child set mid-year goals. Like New Year Resolutions, a goal can be set for grades, behavior, or organization…anything that will help a student become more successful. Your role as parent is to sit down with them to determine what they want out of the rest of the year — reasonable goals that can be met while still being challenging. After that is done, support your student. Support does not mean doing the work or organizing them. It means helping when they need it, knowing when they are just tired or being lazy, and encouraging them to be their best. Be supportive without taking over—that is the tough part. Over the years, many of the rebellious kids I have seen tend to be rebelling over their perception that grades are more important to their parents than they are themselves. Show them that your love is not conditional on them getting the grades you feel they should get. Push them hard, but not at the expense their view of your acceptance and love as they may try to turn it into a power struggle. “You can’t make me!” is a common refrain in the teenage vernacular—so don’t get into that battle, just let them make the work their own. Once you have you have shown your support by helping plan and goal set, show faith in your students to carry out their plans and learn from their mistakes. What does this mean of us as parents? Don’t nag. You will become the proverbial clanging gong to your kids. Remind them once or twice and then let them go. Their homework is just that, theirs. You finished school and can help them, but they need to have ownership of it now. One thing we learned from the diocesan survey last spring is that the students want more ownership of their educational experience. If they don’t complete something, allow them to experience the consequences of a poor grade. As taught through Love and Logic, show empathy not disappointment. Make sure they understand you have faith in them to make it right, and that you love them no matter what. The more students are part of their own education, the more they take ownership and will want to be more successful—not for you, but for their own feeling of accomplishment. Intrinsic motivation—coming from within yourself—will always beat extrinsic with you leading the way. For the schedule: January 16th is our Open House for perspective families. If you know anyone who might be looking for a school, we would love to show them around and let them see what makes MIS special. Krause’s Koffee for 3rd through 5th is on the 17th of January as well. Happy 2018, Mustang Families! We finished out 2017 strong and are looking forward to an exciting 2018. The PTC was busy in the month of December and there are no signs of slowing down coming into January. Thank you to all who helped with Christmas events, and who have stepped forward to help in January as well! This month our focus is on Catholic Schools Week. We have events planned each day beginning with Student Appreciation Day on Monday, January 29th. The fun week wraps up on Friday, February 2nd with Grandparents day and an early dismissal. 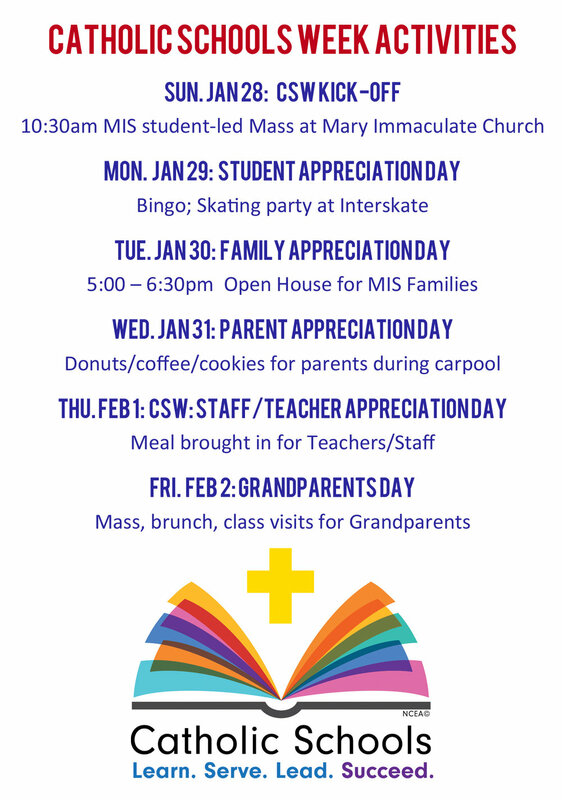 We encourage all of our families to join in the festivities and celebrate Mary Immaculate during CSW! We are less than two months away from our biggest PTC event — The Heart of Gold Auction on February 24th. The Auction team, led by Jenny Long, has been working tirelessly on making this our best auction yet! There are three Auction Gift Gathering parties being held in January. The first is on January 19th for parents of Kindergarten-2nd grade. The second is on January 20th for parents of 6th-8th graders and the third is on January 27th for parents of 3rd-5th graders. Please mark your calendars and gather your friends for both the gift gathering event and the Auction! Happy Holidays to everyone. I hope you had a wonderful Thanksgiving and are in full preparation for the coming Advent and Christmas. In keeping with our continued focus on Family, we will be sending home a book of prayers provided by the Knights of Columbus. The prayers are centered on mothers and intended as a gift to all of our MIS moms. I hope that some of these prayers can bring you peace and joy in the upcoming holiday season. On the 30th of November we completed a lock down (going forward this will be called a lock out) drill in conjunction with the Farmers Branch police. This was simply for practice for the students and was at our request. I wanted to make sure our staff knows the drill and that we could find any quirks in our procedures that need to be addressed. This was also an opportunity for the police to see what we do and to help us plan for any such instances. We hope and pray we will never use this information but it is best we have it. I hope you have taken the time to talk to your own students and help them understand the world around us. This all leads back to my word for last year and society's lack of empathy for our fellow humans. Only through understanding can we be a better people. I hope you can take time this Christmas to appreciate time as a family. Enjoy each other’s company, have some fun, eat some good food and sing some carols! Together remember the time our Lord loved us so much that he sent his son to be one of us and sacrifice himself for our sins. Many of my best memories as a child are centered around Christmas time. Today as an adult, just being home with my family, especially with my own children, are the best moments of my year. Take the opportunity for quality time with your children along with your extended family. Life goes quickly so you must enjoy it while you can! I pray you all have a blessed and merry Christmas and a happy new year! I can hardly believe we are beginning the final month in 2017! This year has flown by and I don’t see December slowing down at all! November was a very busy month. We kicked off the month with our first annual Family Game Night. It was a great evening of games, food and fellowship! The PTC is looking forward to making this an annual event. Our monthly service project was for St. Vincent de Paul’s Thanksgiving Food Drive. Your generosity and care for others is amazing. The MID’s put on a great 4 on 4 event this year. This event shows our Mustangs competitive spirit as well as comradery. We wrapped up November with a thankful heart. All of the Thanksgiving feasts that were enjoyed by our students, Teachers and families focused on the many blessings we each have in our lives. Many thanks to the many hands that organized these activities this month! Now that November has come to an end we now transition into the season of Advent. As we each are awaiting the onset of Christmas parties, Christmas Break, and time with family and friends let us all take a moment to remember the true meaning of this season — the awaiting and preparing for the birth of Jesus. Heart of Gold Auction 2018: Vegas, Mustangs are All In! The countdown to auction is on! There are three months until the Heart of Gold Auction 2018 on February 24th and they are going to fly by! The night is coming together in true Vegas form. Dress to impress for your photo at the Step and Repeat and have a keepsake from the night of you and your honey! Elvis will be performing, before “Signature Band” takes the stage for everyone to dance the night away! We will have a small casino event of Texas Hold Em for those who like cards. If dice is your game, there will be a dice game with a Grand Prize of $10,000!!! Keep an eye out in January for more details on these events to come via Facebook and the Mustang Email. There are many ways to participate in the auction before the big night. Our Silent Auction Chair, Karen Thomas, has sent out a Sign Up for Gift Gathering. Please take a look at it and save the dates for the new, adult only, Gift Gathering Parties. January 19th (K-2nd) will be hosted by Eric and Adele Verdiguel, January 20th (6-8th) will be hosted by Mauricio and Elisa Ortiz-Segura, and January 27th (3-5th) will be hosted by Steve and Erin Blair, all set to begin at 7PM. Watch for your invite to these fun Gift Gathering Parties, they will set the auction season off! Our Live Auction Chair, Julie Fredericksen, is working hard to put together some great packages to bid on the night of the auction. She has a wish list for donations to help make these packages great! If you have a way to contribute, please reach out to her and let her know. The Underwriting Co-Chairs, Michelle Alonzo and Elisa Ortiz-Segura, have also been working to develop underwriters for the night of the auction. They will be sending out correspondence via Kid Mail, the school website, and Facebook. If you have an interest in contributing to underwriting, please reach out to either one of them for assistance with the right package for you or your business. The auction committee is excited to announce Rudy and Carolyn Tovar for this year’s Honorary Chairs! They have two decades of service and activity at Mary Immaculate church and school, and we are honored to have them as Alumni Parents. When you see them, please thank them for their continued support of MIS! The Heart of Gold Auction 2018 would like to thank the parents of Mary Immaculate for its continued support of our precious school and children. This night promises to be full of fun, excitement, and non-stop activity! Come prepared to dance, gamble, and remember, Bid high and Bid often! We are looking forward to seeing you all, on February 24th, 2018! The teachers and staff use the test to evaluate where both individual students and the school need help or where both are succeeding. Students cannot pass or fail the Iowa test, nor are the results used to assign any academic marks. Testing may be used for Decats or Duke Tip nominations, and high school selection. Teachers utilize the information from their classes to look for areas we can work on. By taking this test in the fall, teachers can use this information with the class they have now and thus improve overall education. Percentile rank is the score that shows where a student stands in comparison to others who took the same test this year. It compares the scores and ranks students according to where their score lies on a 99-point scale. 50th percentile is the average score for this test. With the Holidays just around the corner, we are entering a season when my word for the year may hold a bit more meaning. Family is incredibly important to many during these months and I hope you can all spend time as a family just being together and enjoying the gift of each other. With Thanksgiving coming we are reminded that a meal with our own family can be one of the best moments of our year…and I would remind you that you can do this every day with your own children. In fact, I highly recommend it as a way to not only catch up at the end of the day, but to also be able to share what is important to you so that your children know you better. May you all have a blessed and fun Thanksgiving! That Christians in Asia, bearing witness to the Gospel in word and deed, may promote dialogue, peace, and mutual understanding, especially with those of other religions. The PTC board has remained hard at work this October, a month full of events and services that the PTC has lead and supported. Our Room Parents and Volunteer Services Committee worked hard leading up to and through the Mary Immaculate Fall Festival, and are very thankful to all the families that participated. We had so many families help set up, donate, bake, participate and clean up. This wonderful festival benefits both Mary Immaculate Church and our school. It was great seeing so many families enjoying themselves during the Friday night preview and then again Saturday. We know how busy everyone is with academic, club and sporting events, and our entire MIS/MIC community is so grateful for your dedication and support. Speaking of dedication and support, we must once again thank you for your generous offerings and support of helping our brothers and sisters in South Texas, Florida and Puerto Rico. You all have truly changed lives and instilled hope. We received a very thankful letter from the Corpus Christi Catholic Schools office. Your donations, prayers and support have made a huge impact in getting their schools and the lives of their students back to normal. Our Spiritual Enrichment Committee has done a phenomenal job identifying service projects that make a difference in the lives of those receiving and those giving. Thank you to the Community Enrichment Committee for organizing the MIS Chick Fil A day on Thursday October 26th. It is always great to get our families together for fun and fellowship. We are looking forward to their next event on November 5th with the Family Game night. We hope to see you all in the Parish Hall for more MIS Family fun! The Pep Rally on Friday the 13th was electric! It was also great to finally see the championship banners unveiled for 6th grade boys D-2 basketball, 5th grade JV and D1 Varsity boys baseball, Varsity boys Rec Singles in Tennis, and JV Girls and All Around Swimming champions. Way to go Mustangs! The Auction team has been working non-stop and the anticipation for the 2018 Heart of Gold Auction is definitely high! They have a “must not miss” auction night planned, so make sure February 24th is circled on your calendar! Our Auction Chair, Jenny Long, and her team will be unveiling a new auction website in November with details on how to be an Auction sponsor, donate, purchase tickets, reserve hotel rooms and many other details. As always, thank you to all of our Mustang Volunteers! Well, it doesn’t really feel much like fall yet, but the calendar says it is here…and that means the Fall Festival is coming! This is a fun opportunity for community building within the church and school. Our drill teams will perform, as will several of our students in other capacities. There will be inflatable rides, games, great food and a lot of fellowship. I hope to see you all on Saturday the 7th of October. Thank you to all of our MIS families (Alonzo, Verdiguel, Zang, Gasper, Hoffman-Hernandez, McIntyre, Kratovil, Ortiz-Spencer, Hyams, Galindo, Ruiz-Alvarez) who promoted MIS at MIC Masses the Sunday prior to our Prospective Family Open House. Many of these parent ambassadors stepped outside of their comfort zones to share their personal story of why they chose MIS for their children and why our school family keeps them coming back. Thank you to all of you who participated in the North Texas Giving Day as well as donating to help the students of Catholic schools in Corpus Christi, particularly True Cross Catholic School! What an amazing group of people we have that would give so willingly to help our fellow Catholics and the young people who attend those schools. You again showed how strong we are as a community and how much we are eager to help when called. This blends in very well with my theme for the year of Family. We are one family of faith and of human kind. Helping each other is where we show that support and how we can be good to each other. In this time of divisiveness on all sides we can be a pillar of kindness and caring that shows the negative influences that we will not be dragged down and we will do what we can to help. What’s more this is a great example for our children to see and to understand that we are stronger as a community and that our differences make us stronger. Let’s get out and support our Mustangs! On behalf of the PTC Board, I would like to thank all of you who have participated and volunteered in the many PTC organized events this year – and we are only just wrapping up September! We are so blessed to have such a strong Mustang Family and your participation and support are unmatched. We are in our fourth year using the MIS PTC online directory, MySchoolAnywhere. We have approximately 600 parents who are accessing it regularly. This directory is administered by the PTC as we pay an annual license fee. (This is separate from RenWeb which is maintained by MIS administration). Julie Frederickson, PTC Vice President, has done a phenomenal job this year updating and cleaning up our directory, allowing us to focus more on utilizing the MSA directory’s volunteer sign-ups feature. The PTC board and room parents use this as their main form of communication for classroom events and event sign ups. It also allows event coordinators the ability to track and monitor the events plus send out reminder emails. For families who have multiple students and in various grades, it is a great way to view all your MIS volunteer signups in one system. You can print a list of your child’s classmates by grade and you can add families to your favorites list for quick reference. If you are not currently using MSA or have questions on access or use please contact Julie Frederickson for assistance. A BIG thank you to our Volunteer of the Month, Jacob Riney. Jacob has been instrumental in managing the Junior High Wing renovation project. He has given an abundant amount of time, expertise and sweat! Thank you so much Jacob! Thank you to Nolia Norra and Angie Borino our Spiritual Enrichment Chair and Co-Chair for all their work in celebrating Mary’s birthday – this is always such a beautiful celebration. They have also been working diligently on raising awareness, funds, and goods for the many recent tragedies that have occurred here in Texas, Florida, Mexico and now Puerto Rico and the US Virgin Islands. We have many in our MIS Family who have been impacted by these events and I am so proud, although not at all surprised, by the generous response. As always, thank you to the countless volunteers who support the PTC, children, teachers and staff. Our community is so strong because of each of you giving so selfless of your time and talents. To our new families, welcome to Mary Immaculate! And to our returning families welcome back! We are prepared for another great year at MIS! We’ve already been in school for a few weeks and everyone seems to be back in the swing. I have enjoyed meeting the new students and parents and I know the teachers have as well, particularly at Great Expectations. I hope all of your students are feeling settled, made new friends and become reacquainted with old ones. It’s going to be a great year! My theme this year is Family as we have been discussing. With that them I include your immediate family, of course, but also our Family in Christ as Catholics and as human beings. My belief is that if we begin to see each other as brothers and sisters, we begin to treat each other with more kindness and increase our empathy for our fellow people. Last year I focused on empathy and saw changes in our student body in the way we treated each other, so I want to continue that this year and improve on it. As I told the students last year, we can make this world better by starting small and local, then it can grow beyond to help all people, not just our fellow Mustangs. A prime example of this is the way we respond to Hurricane Harvey. We have started with our small fundraiser and I have been blown away by the response. Every cent we give will help with the diocese of Corpus Christi as they rebuild after the hurricane. I am sure we will be asked to help in other ways as well so please keep an eye out for any announcements from MIS or the diocese. That our parishes, animated by a missionary spirit, may be places where faith is communicated and charity is seen. On behalf of the Mary Immaculate School PTC: Welcome to the 2017-2018 school year! Even though summer always goes by too quickly, we are very excited to be back with our MIS family! As Mr. Krause talked about at Great Expectations, the word for this school year is Family. I want to emphasize the significance that our MIS family has in volunteering in various capacities for the betterment of our school. This does not only include the PTC volunteers but all MIS volunteers. Your efforts result in lower tuition costs for all students and help facilitate communication and coordination between teachers, staff, parents, and the Parish. Your actions truly matter in the life of our school family. One of my favorite quotes is: “Those who can, do. Those who can do more, volunteer.” We are truly blessed here at MIS with all of our Volunteers. Your “roll-up your sleeves” mentality is like none other and our children, teachers, administrators and school are for the better. It is my great privilege to tell you of the great things purchased for our students over the summer with the help of the PTC’s Wish List. At the end of each school year, a request is sent to MIS parents and teachers asking for suggestions on items or repairs needed for our school. Once the list is compiled, a committee of parents, teachers and administration prioritizes the list as to what will be purchased and the order in which it will be purchased. Between $17,000 to $20,000 is spent annually to cover these Wish List items that would generally not be covered by the school’s operating budget. With the remaining funds, we are researching the possibility of replacing the tire pieces on the playground. Thank you to all who supported the PTC activities last year! The PTC board welcomes you to join in our meetings which are held every 2nd Wednesday of the month at 7:00 pm in the MIC conference room. The Mary Immaculate PTC provides a forum for parents to participate directly with the school. That participation helps to positively impact our children’s educational and spiritual experiences. Whether you have a lot or a little time, all of your creative ideas, your time and your talents are wanted and needed. There are countless opportunities for you to help and to get involved. The more involved you are, the more you and your family benefit from this rich experience at Mary Immaculate.